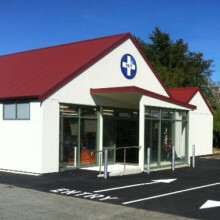 Waikiwi Vets is Invercargill’s oldest private veterinary practice which dates back to 1954 when it was the sole practice of Irish immigrant Paddy Dunne. After completing his veterinary training in Dublin, Paddy travelled to New Zealand in 1951 on a working holiday. Paddy Dunne (together with another Irish vet, Paddy Cahill) landed in Wellington where he was immediately posted to the Clutha Vet Club a farmer owned co-operative. Soon after he met Grace Coll, the daughter of a Clydevale farmer, and decided his New Zealand stint may be more permanent. In 1954 couple were married in Invercargill and Paddy Dunne opened a sole practice at Waikiwi working from his North Road house. Soon after the house burnt down. Paddy tells us the fire was caused by an electrical fault, sparked by a heating pad he’d rigged up for an injured dog. The dog survived. The house wasn’t so lucky. Ray Harper (of Southland Rugby fame) built a small surgery at the front of the section for Paddy to continue working (this building later became a book exchange, and still later, a coal store); before building a permanent home at the rear of the section, where Paddy & Grace raised their five children. Paddy covered the whole range of animals in Southland at the time – a true mixed vet with the opportunity to develop new ideas in a rapidly expanding agricultural environment. Paddy Dunne is credited with introduction of the Charolais beef breed to NZ, using pioneering artificial insemination technology on a herd of Northern Southland cattle. Around 1960 Ray Harper employed again to build a two man surgery next door when the business was rechristened Dunne & Warnock following the arrival of Hugh Warnock, a Scottish trained vet, who worked at the Clutha Vet Club from 1958 to 1959. By then New Zealand was looking at training its own vets to address the skill shortage. In 1964 Massey University in Palmerston North opened its door to the country’s first Veterinary Science students – and among the class of 32 was Peter Williams, the son a Central Otago Anglican Minister, who became in November 1967, the first NZ vet to join Dunne & Warnock. Peter Williams was paid £1500 per annum; his wage increasing to £1800 per annum to reflect the heavier workload when Hugh Warnock retired about six months later. Peter Williams recalls the vet surgeries of the day were little more than a room where drugs and equipment were stored. Although the practice was named Dunne and Warnock in the real world it was only ever called Invercargill Vets because, aside from Fleming Jensen’s small animal practice in Tay Street, they were the only vets in town, Peter Williams said. With more New Zealand vets graduating it became easier to attract vets to the South for short stints. (In 1968 Stuart Cameron and Garry Chisholm both worked a season at Invercargill). Paddy then broke his neck in a diving accident on a family holiday at Nelson in 1969. Paddy leased the practice to Peter Williams for four years, before eventually accepting his working days were over and selling it outright in 1973. Working long hours assisted only by a succession of young vets (including Doug and Sandy Cooper in 1974 who went on to set up Elles Road Veterinary Clinic), Peter Williams kept the practice going. In 1975 he went into partnership with Mike Brown – creating Vet Services Invercargill. In 1978 they were joined by John Allan, and about five years later Lester Laughton joined the partnership. Mike Brown left in 1986, after being diagnosed with chronic brucellosis, Lester stepped down in the early 2000’s also for health reasons. In 2003, Peter Williams moved into an part time roll after heart surgery & retired completely in the late 2000’s. In 2010 the practice officially changed the name to the one all their patients had been using for many years – Waikiwi Vets. In 2016 John Allan retired after working at the Waikiwi Vets since the early 1970s.